Mixology Monday is a monthly activity organized originally by Paul Clarke at Cocktail Chronicles. More info here. This month is hosted by Gwen at Intoxicated Zodiac, and the focus is on Orange – you know, in celebration of us Leos. Stir (yes, even with the juice – eliminates frothiness from OJ) and strain into chilled cocktail glass. Twist orange peel over drink, run skin along rim, and discard. I’m jumping on this a bit late in the game, but Saturday night at work, I had the idea for this drink in the back of my mind. I waited for just the right customer – a certain group of regulars who really aren’t allowed to refuse new drinks. At 1:00am I got a little worried, having seen some good regulars, but not my cocktail guinea pigs. I made one up anyhow and the barback and I took it as a shooter (it was a stressful night, ok). Delicious! Oh and how the flavors lingered. But I’m biased, and the barback risks a shaker to the head should he disagree. And then Erika showed up! Oh Erika, how you’ll drink anything with gin. Did you hear gin makes girls cry? Of course you didn’t, and you’d probably sass me somethin’ fierce should I say so. There are so many flavors in this drink that would dominate on their own. The maraschino, for one, has a tendency to take over and funk everything up should you add too much. Chartreuse, likewise, can get a little ridiculous for some people’s taste. I chose yellow here because I feel it has a more rounded, less harsh herby-ness to it. Don’t get me wrong, there’s nothing I love more than a nice Champs Elysee or a snifter of Green VEP on its own, but to pair and enhance the orange, I think the yellow was the best idea. And Peychaud’s just adds a little something special every time…and that great ruby coloring with the OJ. Sorry for the lame name. We’ll change it soon. 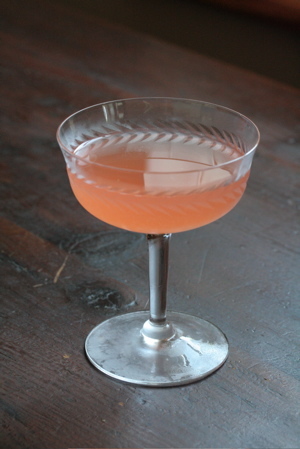 This entry was posted on August 13, 2007 at 8:03 pm	and is filed under Cocktail Recipes — Original, Mixology Monday. You can follow any responses to this entry through the RSS 2.0 feed. You can leave a response, or trackback from your own site.